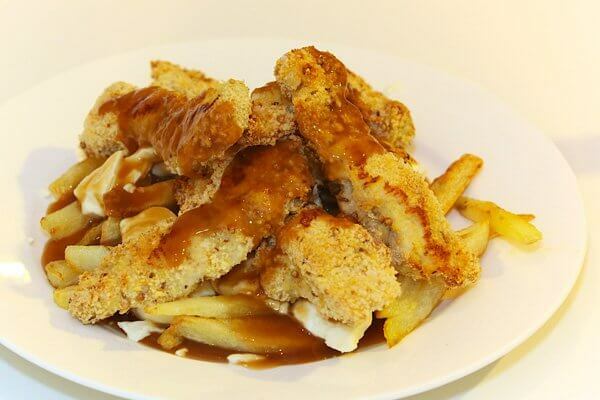 I absolutely love poutine, and if there’s one thing that the Montreal Poutine Week has proven, it’s a very versatile dish. I had been a classicist for so long (believing poutine should just be fries, cheese and gravy), but I have since opened up to more creative versions (Montreal smoked meat poutine being a current favourite). I rarely make poutine at home given that it’s ubiquitous in Montreal diners. But this weekend, I decided it would be fun to have poutine at home. I turned to my tried and trued recipe for oven french fries, that has you cut russet potatoes into fries, soak them in water, parboil them, then roast them in a hot oven until the outsides are crispy and golden. They never fail. To top it off, I made chicken fingers made from breading sliced chicken thighs with flour, egg, and panko crumbs seasoned with whole mustard seed, cumin and coriander.